Posted by admin in activity reports, Caribbean, Costa Rica, Ecuador, eruptions, Fuego, Guatemala, Hawaii, Indonesia, Japan, Kamchatka, Karymsky, Kilauea, Kliuchevskoi, Mayon, Mexico, Pacaya, Philippines, Poás, Popocatépetl, Russia, Sakura-jima, Santa María, Semeru, Shiveluch, Soufrière Hills, Tungurahua, United States, Weekly Volcanic Activity Reports. The Smithsonian Institution/United States Geological Survey Weekly Volcanic Activity Report for 24 February-2 March 2010 is now available on the Global Volcanism Program website. The following is a summary and not a substitute for the full report. New activity/unrest: Poás (Costa Rica), Semeru (Indonesia), Soufrière Hills (Montserrat). 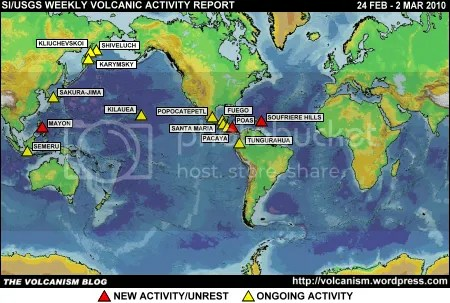 Ongoing activity: Fuego (Guatemala), Karymsky (Russia), Kilauea (USA), Kliuchevskoi (Russia), Mayon (Philippines), Pacaya (Guatemala), Popocatépetl (Mexico), Sakura-jima (Japan), Santa María (Guatemala), Shiveluch (Russia), Tungurahua (Ecuador). Posted by admin in activity reports, Alaska, Batu Tara, Caribbean, Chaitén, Chile, Colombia, Ecuador, eruptions, Fuego, Galeras, Guatemala, Hawaii, Indonesia, Japan, Kamchatka, Karymsky, Kilauea, Koryaksky, Mexico, Papua New Guinea, Peru, Popocatépetl, Rabaul, Redoubt, Russia, Sakura-jima, Sangay, Santa María, Semeru, Shiveluch, Soufrière Hills, Suwanose-jima, Tungurahua, Ubinas, United States, Weekly Volcanic Activity Reports. 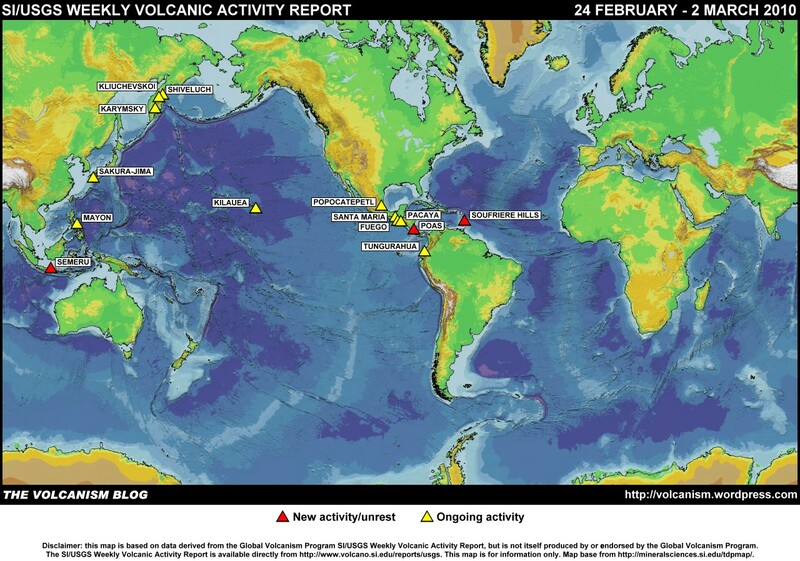 The Smithsonian Institution/United States Geological Survey Weekly Volcanic Activity Report covering 4 March 2009 to 10 March 2009 is now available on the Global Volcanism Program website. The following is a summary and not a substitute for the full report. New activity: Koryaksky (Kamchatka, Russia), Sakura-jima (Japan), Semeru (Java, Indonesia). Ongoing activity: Batu Tara (Komba Island, Indonesia), Chaitén (Chile), Fuego (Guatemala), Galeras (Colombia), Karymsky (Kamchatka, Russia), Kilauea (Hawaii, USA), Popocatépetl (Mexico), Rabaul (Papua New Guinea), Redoubt (Alaska, USA), Sangay (Ecuador), Santa María (Guatemala), Shiveluch (Kamchatka, Russia), Soufrière Hills (Montserrat), Suwanose-jima (Japan), Tungurahua (Ecuador), Ubinas (Peru). Posted by admin in activity reports, eruptions, Indonesia, Semeru. The news from Indonesia is that Mount Semeru on Java erupted early today. The volcano apparently erupted shortly after midnight, ‘spewing smoke and ash high into the sky and coating a nearby town in black dust’. Recent heavy rains and the direction of the wind restricted the impact of ashfall. No evacuation has been ordered but volcanologists are monitoring the volcano closely ‘for signs of lethal heat clouds’ – the term often used in Indonesia for pyroclastic flows. Semeru is the highest volcano in Java (3676m) and one of the most active: the Global Volcanism Program observes that ‘Semeru has been in almost continuous eruption since 1967’. UPDATE: The Indonesian volcanological authorities have raised the alert level at Semeru to the second highest level of ‘siaga’ or orange (the Reuters India report cited below incorrectly reports it as the ‘maximum’ level). Posted by admin in activity reports, Indonesia, Semeru. A correspondent has helpfully provided more information derived from the Indonesia media about the current alert at Semeru (reported here) and has translated local news reports, throwing more light on the nature of the volcano’s activity. The ‘heat clouds’ referred to in some reports clearly were pyroclastic flows. The reports come from the Javanese Kompas newspaper and were apparently sent in by Blackberry from an observer on the spot. A 4-kilometre exclusion zone has been established around the volcano because of the danger posed by pyroclastic flows, and the Directorate of Volcanology and Risk Mitigtion warned on 23 May ‘although there is no cause yet for evacuation, residents should be alert up to 10km from the mountain centre in case of potential lahar, lava or pyroclastic flows’. A large number of earthquakes (more than 40) was registered between 00:00 and 18:00 on 23 May along with significant ash emissions. Since 15 May Semeru has released 12 pyroclastic flows with a range of up to 3 kilometres, and there is the potential for future flows to reach as far as 9 kilometres from the volcano. It’s impossible to get any information from the Directorate of Volcanology and Risk Mitigation website at the moment because, as is not infrequently the case, the site is down. I hope no-one has to depend upon it for information in a crisis. Fortunately (perhaps) Indonesians are used to living with volcanoes: as my correspondent puts it, ‘The local villagers are so used to seeing these eruptions and so used to all the warnings etc it generally needs lava or a pyroclastic flow flowing through their back yard before they will move or evacuate’. The alert level for Mount Semeru, the tallest volcano on Java and one of the most active, has been raised to level three after it spewed ‘heat clouds’ down its slopes, media reports say. Do they mean pyroclastic flows? The Indonesian authorities have said that the activity poses no danger, and urged local residents to remain calm and stay put. Semeru has effectively been in a continuous state of eruption since 1967.